Tag Clouds – A nice way to target your social media destination! 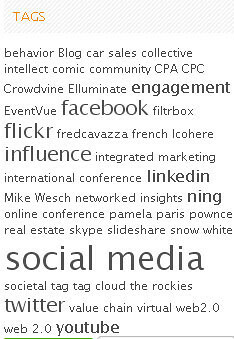 Well hello… I thought I would expand a bit on the Tag Cloud idea. I see many corporate blogs that blog about the latest product, the latest conference they are attending, the latest group outing at the local bowling alley etc which is all nice and will certainly drive traffic to competitive products that have better SEO, to that conference or from the bowling fans… Not really the people you were expecting, are they? It’s time to bring discipline to your business blog and communication in general. We’re here to drive traffic….drive traffic to YOUR site(s). We want customers and prospects that fit your target demographic and have the same behavior. They are the right customers with the same purchasing pattern. They will type the same keywords in google and they will pay attention to what their friends are saying about the latest wizz bang gadget or service. Before we go further, I just want to reiterate why tag clouds are important. Search Engine Optimization and Social Media Optimization are driven by keywords and behaviors –the better you balance these, the better you will drive traffic to your blogsite. Now, you may ask: “Do search engines pay attention to the weight of each tag in a blogsite?” YES! They are increasingly starting to; for example SearchCloud.net just launched it’s new search engine. Techcrunch analysed it here (apparently, not so good yet). Now that you have 20 keywords (or so = completely random number), you will have to weigh them proportionally. Blog every day 🙂 about what matters to your ideal customers and make sure your Blog Tag Clouds start looking like the one you just designed. In other words, the tag cloud is your target – your entire social media program needs to link back to this tag cloud across the multiple platforms you’re using. 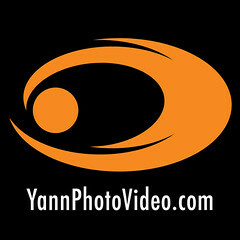 If you are looking for more information about SearchCloud.net – there’s youtube of course!